Back in the early days of UFO research photographic evidence was a much sought after commodity as in those times before Photoshop and other computer programs that we have nowadays. Still photos were somewhat easy to have analyzed for any possible evidence of darkroom trickery. Hence many of the classic stills of UFOs such as the Paul Trent photos of almost seventy years ago have stood the test of time and remain iconic images to this day. However, back in the day motion picture footage was relatively difficult to fake without sophisticated and extremely expensive equipment usually found in Hollywood film studios. Hence, the really authentic looking motion picture films taken during this time period are rare. 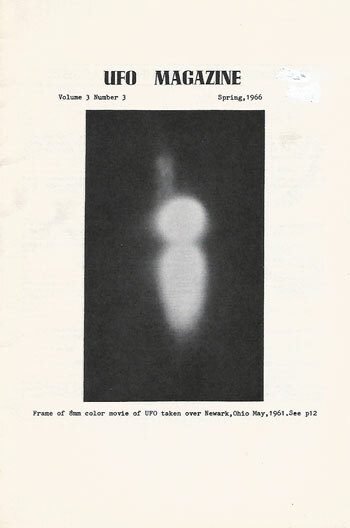 What follows is a brief summary about the movie taken of an unknown object on the night of May 29, 1961 by a young man named Craig Seese and witnessed by a number of other young UFO enthusiasts while on a sky watch. Back in 1962 I was reading the May issue of Ray Palmer’s Flying Saucers magazine and read about a movie of a UFO being shot in Newark the year before. The item was sent in by a young man named Robert W. Miller who was the president of a local UFO study group known as the UFO Research Committee (UFOCR). I immediately called up Miller and inquired as to how I might either view the film or secure a copy of it for my collection of UFO photographs. Bob and I were about the same age and immediately hit it off and began corresponding and exchanging UFO reports and such on a regular basis. Later that summer, I finally made it down to Newark for a personal visit and was able to view the film for myself as well as talk Bob into having a copy made for me. It turned out that Miller and I would work closely together on several Ohio UFO organizations over the years and establish a personal friendship. Bob Miller passed away in 1991 after having moved out to Florida for employment reasons. UFORC was made up of probably twenty UFO enthusiasts from the general area and used to have informal meetings, hold sky watches and publish a small newsletter. One of their favorite sky watch sites was Hornshill, a local park located in the heart of Newark that commanded a magnificent view of the surrounding area. Over the subsequent years I sky watched there with Bob and some of the other locals. On the night in question a number had assembled for a sky watch and brought their binoculars and telescopes in hopes of spotting something unusual. Luckily, Craig Seese brought his Brownie 8mm camera loaded with color film, as about ten p.m. several in the group spotted what looked to be a single bright white light heading in a northerly direction. Seese immediately switched to the camera’s telephoto lens of 2.5 power and set the Brownie to f/1.9 and began to shoot. What showed up on the approximately one minute film was a ball-shaped object with a tail of some sort on the bottom that seemed to diminish after a number of seconds. This “tail” may indeed have been some artifact associated with the camera lens or possibly have been caused by atmospheric conditions. In several frames another smaller light appears to come out of the object go out of frame. The film was shown to a writer from the local paper, the Newark Advocate and on June 22 of that year the story appeared generating much local interest. Copies of the film were also sent to NICAP and APRO, although neither organization apparently was able to secure the services of someone who could do a comprehensive analysis. To me, at least, the film has stood the test of time and remains an important early photographic record of a truly unknown object.